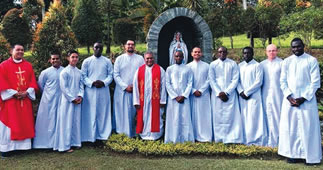 On Friday 18 January, ten men began their Society of Mary novitiate in Eden, Davao, Philippines. They are pictured below. Fr Fernando Ingente SM, novice master (Philippines), Seremaia Turagabeci (NZ), Mark Emzee Lazaga (Philippines), Joel Ama (Cameroon), Hemi Ropata (NZ), Fr Jacob Aba SM, formator (Solomon Islands), Fabrice Souga (Cameroon), Paul Crocker (Fiji), Clinton Kube (Cameroon), Leonard Wuiz Amora (Bougainville), Nik Rodewald (USA) and Lesley Kinani (Bougainville). Fr Joaquin Fernandez SM, formator (Spain) is not in the photo. Please keep them all in your prayers.